We specialise in correx board printing. With over 12 years of experience we supply major brands with correx signs nationwide. Correx boards are a Cost Effective way of advertising. From as low as R7* per board. Correx signs are Weather Proof. Your advert will not smudge or fade outdoors. A2 correx boards and A1 correx boards are the Most Popular correx board sizes. We offer FREE Nationwide Delivery. 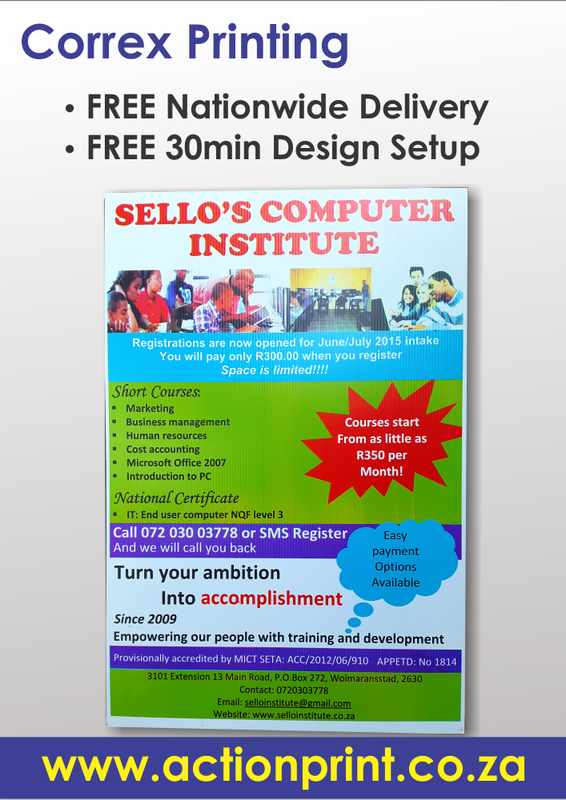 We can help you with FREE Design and Layout for up to 30min. 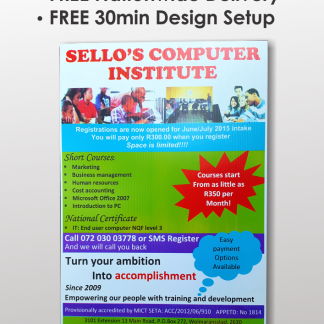 Due to the many printing options, please email your design or requirements to orders@actionprint.co.za. We will send you a full prices list with our recommendations. If you want professional correx board printing, Contact Us Today! We have over 12 years of experience in correx boards printing and specialise in the screen printing method. It is an old but still very popular and affordable printing process. We do however offer other printing solutions to suit your needs. We offer FREE Nationwide delivery, friendly advices and FREE 30min design assistance. You have come to the right place. We will help you get the best results. A full sheet of correx board is typically 2400x1200mm. More popular correx sizes are a2 correx boards and a1 correx boards. Correx boards thickness may vary from 3mm, 3.5mm up to 5mm. White correx boards are most often used with yellow correx as the second most correx used. You can get correx signs in red, black, blue and green but these correx are not used as often. Estate agent boards, for example, for sale boards or to let boards are some of the most popular uses for correx. On show boards or pointer boards are also printed on correx. 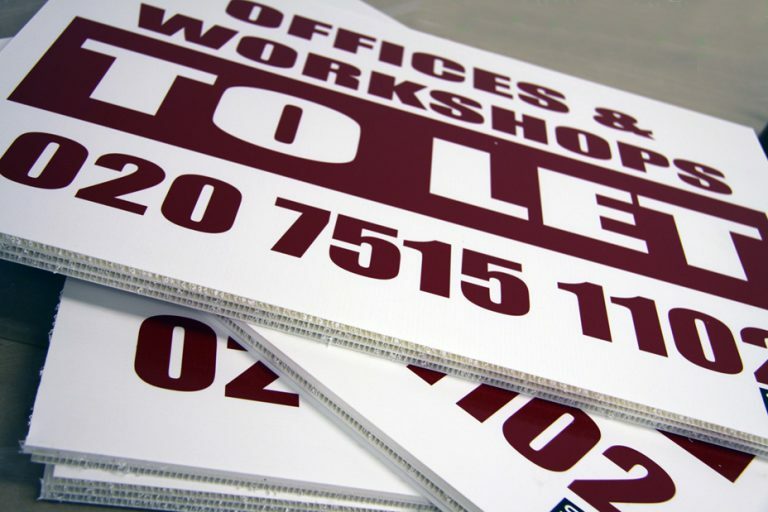 Correx signs are light weight and weather proof, making them ideal boards for estate agents. Correx signs are an affordable signage solution. Corex are perfect for general displays or advertising. From modelling projects to indoor and outdoor event advertising. Corex are perfect as directional signage at events or promotional displays in shopping centers. Screen printing is a very cost effective method of single colours at high volume example for sale boards or to let boards for estate agents. For more information on the history of screen printing click here. 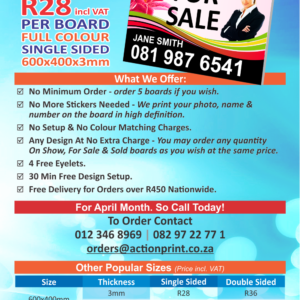 We can also offer digital printing on correx boards. This printing option yields photo quality print whereas screen printing offers a lower definition printing. We know the game and we have done our homework. Do not waste any more time! if you want the best rates around, Contact us today!